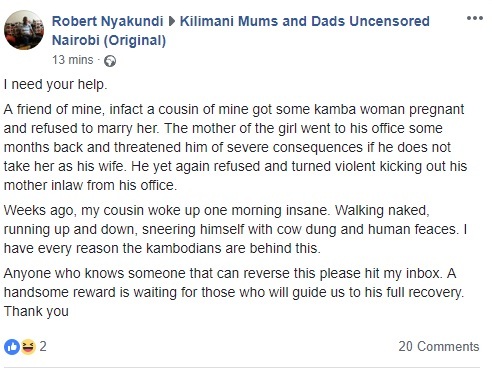 Home / Entertainment News, Media News / Never joke with KAMBAS, see what happened to this man after he impregnated a Kamba LADY and refused to marry her. Never joke with KAMBAS, see what happened to this man after he impregnated a Kamba LADY and refused to marry her. Monday, December 10, 2018 - The Kamba community is associated with witchcraft and a man somewhere is learning it the hard way after he impregnated a Kamba woman and refused to marry her. According to Robert Nyakundi, his cousin has gone mad after he knocked up a woman from Ukambani and refused to marry her. The lady had warned him of dire consequences if he refused to settle down with her and she has made real the threats. The poor man has been running up and down while smeering himself with cow dung and faeces. It’s like the lady bewitched him. See this post on Kilimani Mums and never joke with Kaos.